So I'm at the drugstore sitting, waiting for my prescription to be filled. I need some antibiotics for a cold and some medication to boost my chemo regime. There's these three chairs for people to use when they're waiting and next to them is a blood pressure machine. I suppose it's there to make us all fell guilty that we haven't been checking our pressure on a regular basis. Who me? So, anyway I'm sitting there and across from me, staring me in the face is an aisle full of incontinence products. Yeah, you know, those plastic pants one can wear under their normal clothes. To me, incontinence is largely associated with getting old. It's a serious condition, an embarrassing one, and I suppose these products go a long way in hiding this malady. But I had to smirk as I read the wrappers that packaged up these medical marvels. For instance one was titled "Active" and I thought, hey, just how active can an 80 year old be? Hell, I'm in my 60s and you think you can get me off the couch? Well, maybe if you waved a cheeseburger under my nose. The next label was "Anywhere". Okay, fair enough, if you've got a peeing problem it could hit anywhere. But the one that really killed me was the package with the label "Serenity". "Serenity"? Hell, if I have to pee in public the last thing I'm gonna feel is serene. The other night Mrs D and I were watching the Food Network when one of these ads came on. She turned to me and said "Why is it only women seem to have this problem?" Now, I want to preserve my marriage. So, I didn't make some flip comment I merely shrugged. But she's right. It seems in the land of television advertising only women pee their pants. So finally, after 15-20 minutes of staring at plastic underpants my prescriptions were ready. Good thing. I really had to go now. First of all -- groan. Second -- holy cow! The Moody Blues from way, way back. Very cool. You'd groan too if you peed your points in public. Cool video, eh? It features Denny Laine who later was a key member of Paul McCartney's Wings. Major groan but great video. The reason they don't market these to men is because no man would be caught dead buying an incontinence product for himself. Men can buy these without shame because clearly they weren't made for men. My grandfather had prostate cancer and whatever surgery they performed back in the 60's snipped everything so he wore a clip for the rest of his life. I wonder if incontinent men can get a prescription for one of those from a doctor today? 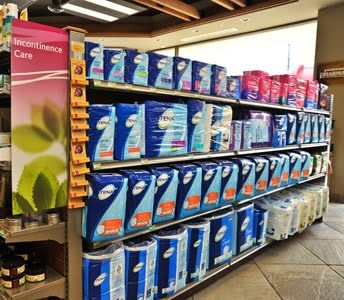 All kidding aside, the real reason these products are marketed to women is that pregnancy does a number on women's bladders and incontinence is a major problem after childbirth. I'm gonna rush right out and get some, cause you never know. What gets me is the amount of shelf space those things are hogging. On the other hand, they're kind of bulky. Ugh. After I read this, I had to pee. Fancy that. They are bulky, for sure. And yet some advertise themselves as being totally unnoticeable. Yeah, right. Anywhere! I fell apart at that one. Hope you feel better! Anywhere, yeah, exactly. That's the whole idea! I had no idea the Moody Blues were together that early on. I wonder if they're needing Serenity now? I suspect the ones that are still alive might.